Awhile back, I participated in a little poetry challenge. The challenge was on the blog of the lovely Velvet of vvb32 reads. 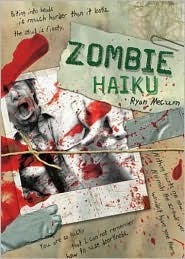 The challenge was to write zombie haiku to win a book called (you guessed it) Zombie Haiku. Imagine my excitement when I was one of the lucky winners! (Thank you, Velvet). So I got my pretty little book of bloody, pus-y (how do you spell pus with a y? I don't mean that as a dirty joke, I just don't know...) book of zombie poetry, and it was pretty much exactly what I was expecting and hoping for. and embarks on the never-ending quest for fresh flesh and the all important zombie food source, brains. Some of this anonymous man's poetry is only so-so (but what do you expect of a man who keeps a haiku poetry journal), and his pre-zombification haiku are as pretentious and pointless as you'd want them to be. But when said poet gets bitten, things take a turn for the worse -- while his haiku takes a visceral turn for the better, in my opinion. Dripping blood and pus and various other fluids onto the pages of his precious journal, he goes in search of the first of a slew of meals - -I mean, victims. (I'm not going to tell you who the first victim is, but ugh). not that it stops us. On the subject of choices, I think Mecum was pretty dead on through out. The progression from surviving human to crumbling zombie is interesting, and the choice of haiku, these short little bursts of thought, is fitting in a way that seems so far-fetched and yet obviously appropriate that it ends up being the perfect choice for a zombie narrator. Design: And the design of this book is brilliant. It is the perfect complement to the text, adding a layer of ick and reality that makes you feel more like you are holding someone's bloody journal, discarded after the world has ended. There are polaroids of zombies "taped" into the journal, maggots, green and bloody smears, sketches, grime and clumps of hair -- it all works together to make the book more of an experience. And it is crucial, I think, because in spite of the continually funny and occasionally brilliant haiku, the book would be too slim and inconsequential without really great design. My final say: Long story short, if you're in to zombies, looking for a light/fun/gross/seasonal read, this is a great way to go. my head. You missed. Lunch! Zombie Haiku also has its own Myspace page, which is the location of the blog. I just went and wishlisted this book after reading your post. My students would love this! And, I saw other haiku books while I was on amazon. Thanks for the lead!